You, your loving husband Pierre and your daughter Alice live a charmed life in a little cottage. All your friends are there too, just a quick trip to the Taleworld through your library. But one night your daughter mysteriously falls into a coma and when she finally awakens, she’s kidnapped by a horrifying monster through the mirror in her bedroom. Then the world around you starts coming apart at the seams. Distraught, you and Pierre must once again risk your life to save not just your daughter but the world! This game is awesome. There, I’ve said all I needed to say. Go play this game already. No, seriously, don’t sit around waiting for some kind of twist where I say it’s really awful or something. Cause it’s not, it’s seriously good. GO PLAY IT! If you click on that picture, you’ll be linked to a much bigger version. Normally I shrink screenshots down significantly so they don’t take up much space on my “cloud drive” or whatever but I left this one roughly twice the size of what I normally do just so you can click on it and marvel at how amazing the graphics in this game are. And this is just part of the scene in the game, it’s actually about twice the size since it’s a panorama scene! No, seriously, stop reading this and… you have seen the pictures, right? It’s genuinely that beautiful throughout the game. What are you waiting for? 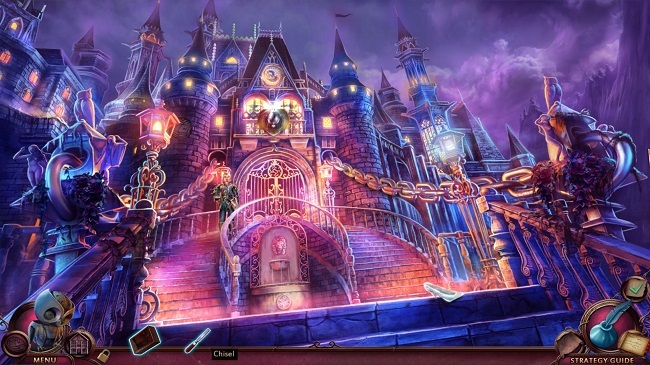 If you like HOPA or fairy tales in general, you owe it to yourself to play this right now. Last time I spoke about NeverTales it was in one of my Casual Friday posts, a concept that I discarded after it didn’t see as much use as I had intended and it left me feeling bored. 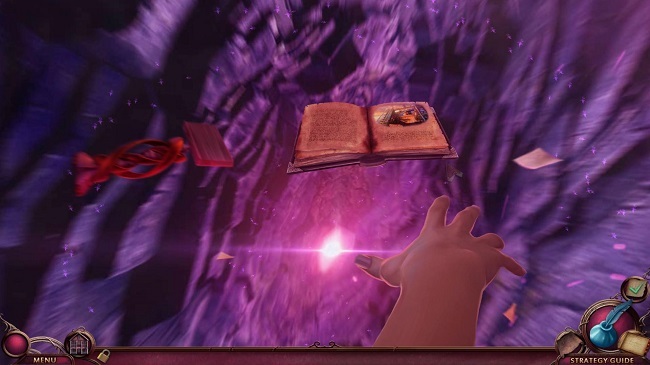 I fully intended to write a review of NeverTales but things just… happened and by the time that I got back to writing about HOPA, it had simply been too long. But I do remember that I thought the game was… okay. Perhaps a bit too sappy for its own good but filled with cool concepts even if they weren’t fully realized yet. The studio would go on to do two games between the first NeverTales and this and it seems to have made all the difference. There are two complaints I have about NeverTales and one of them I’m going to get out of the way right away cause it’s the most subjective. Namely that the story is a bit… meh. I still enjoyed it for what it was, it was the first time I’d ever seen a “Previously on…”-recap in a HOPA and I loved it. It really helps to bridge the gap between games and it’s a god-send for people like me who played the first game ages ago. 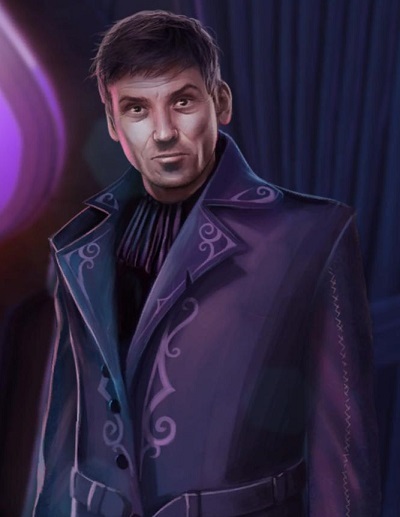 And after playing HOPA-franchises with little to no connection between entries for so long, it didn’t even enter my mind that this game would be a DIRECT sequel to the previous one. I don’t think I’ve seen that since… Awakening, almost. And that was a long time ago. I really don’t know why so many studios tend to avoid this because in my experience HOPA players are quite loyal to their favorite franchises so they’re bound to remember. But the fact that the events in the first game were the catalyst for the events in this game was great. If it was planned, I do not know but it works and made me go “Oh, I actually remember that part. That’s great!” And the story does a great deal in fleshing out the world, now dubbed Taleworld (it might have been called that in the first game, I do not remember), and we’re introduced to the idea that the ability to travel into the world of books is one that’s been around for a while. And that there’s a league of Travelers, if you will, that kind of protect Taleworld. So far, so great. But my complaint is this: whenever you base your story around old legends, myths and fairy tales there’s a real risk of the story becoming… predictable and a bit too sugarcoated. And I do feel that there’s an element of that in this game. The protagonist family is just a little bit too happy, there never seems to be any kind of real internal conflict and everyone is just way too “good”. Beyond “We have to save our daughter” the couple never really seem to have any emotions or doubts beyond selfless heroism which makes it a little boring. I’m not saying you have to make unlikable assholes but extreme situations tend to bring out some bad in people. And I think “daughter being kidnapped through a mirror by a monster” counts as an extreme situation. Even if you’re used to adventuring, give me some conflict, some disagreement on how to proceed and some real anger at the situation. Nobody’s perfect, is all I’m saying. A lot of games based on fairy tales or similar tend to fall into this trap of making the hero and her companions a little too good. And that’s a shame because fairy tales are meant to be tales of caution and self-reflection, teach us to be better, it’s not just stories with happy endings, as it were. I was not a fan of the ending at all, it wasn’t given enough time to develop in a natural way but instead kind of… just happened and everything is explained really fast at the last second which was not okay. I had already guessed a majority of the plot before it was revealed but that came more from having consumed so much media that I can predict most twists based on that alone. And the twist came WAY too late to be of any real significance and didn’t change the direction of the story much at all. Which is the point of a twist. But all of that said, I still enjoyed the story a great deal. I have a soft spot for narratives like this and exploring different worlds based on books and stories that I know is always good fun. Maybe I thought they could’ve done a little more with it but hey, what was here worked really well. It was quite whimsy and I LIKE whimsy if that hasn’t been made exceedingly clear by now. And they had a voiced and visualized protagonist. TWO in fact. Throughout the game you play not only as Belle but also as Pierre. Hell, the bonus chapter is played exclusively as Pierre and it’s how he and Belle first met. Nawwww… Anyway, it’s so rare to be given such a fully realized protagonist in HOPA games and I think that’s a real shame because if a silent, invisible protagonist isn’t done JUST right then the narrative can never fully develop and there’s… too many examples for me to name but Eipix has a nasty tendency to them wrong. Dressing Belle up for the ball was probably one of my favorite activities though I do wish we’d have been given a bit more freedom in the final garment she would wear but oh well, a boy can dream. But because I know Belle and have now experienced two games with her, seeing her in the mirror like that really… matters. In a strange way, I’m not saying I want games about dressing women up for big events is a game I want… though it totally is. And I got a lot more Halloween-feeling from the picture above than I got from Halloween Stories. It’s all just so perfectly executed with the light and themes and everything. Sadly the same cannot be said for the puzzles. Which leads me straight to my second complaint which is that the game was… generally too easy. 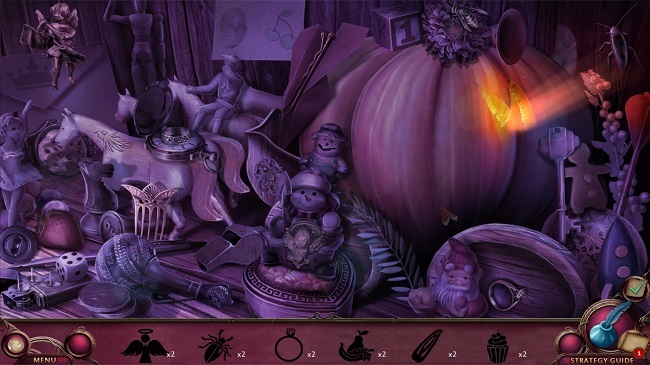 Remember how I in the last review admitted I completely forgot to take pictures of the hidden object scenes? Well, this time around I completely forgot to take pictures of the puzzles. The one used above was one of maybe two or three that I actually snapped a screenshot of. And the others were either not good enough or veered closer to minigames which I’ll talk about in a minute. I just didn’t find them particularly compelling and while excelling graphically, challenge and inventiveness were sorely lacking. Lots of jigsaw and memory games but neither with a particularly engaging twist or unique take. Most of them I pretty much rushed through and the ones that did block my way for a moment or two were often because of me simply not reading instructions OR the game not telling me what to do properly. 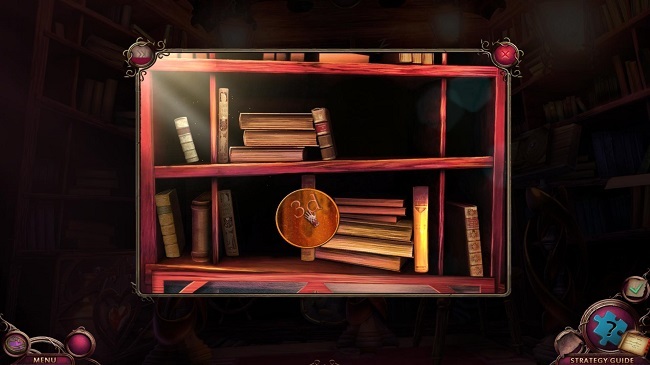 And that is a real shame because the more HOPA move away from hidden objects, the more important the puzzles become. To the point where not offering a decent challenge simply becomes inexcusable. But Mad Head do have an ace up their sleeve and that’s all their little minigames. 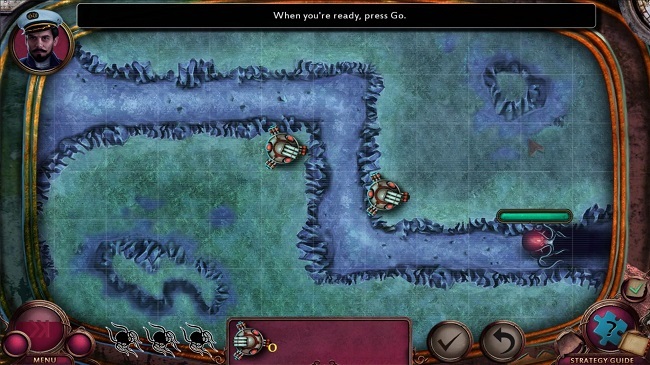 Although they contain puzzle elements at times, they veer far closer to gameplay seen in regular AAA titles outside of the HOPA branch. Hell, there was even a tower defense minigame which is… just wow, okay, that needs to be expanded cause that was way cool. If that had been expanded with multiple levels in the Extras section of the Collector’s Edition I’d be all over that like flies on… uh, cake. Hell, the extra level you did get in Extras section was actually a LOT of fun. Surprisingly fun, even, you might say. Pierre got a whole handful of these types of events, whether it was to climb a wall or fight a curse with a sword (totally a thing that happens) and while I did recognize a lot of these from later Mad Head games, they still remain fun and active ways to spruce up the gameplay. I really do believe Mad Head should expand upon this and perhaps even try to make a full game out of this, perhaps with 3D graphics and a better engine? What I’m saying is, they should enter the indie scene in the mainstream game industry, dammit. Granted, Mad Head have already started moving in that direction with their release of Rocking Pilot… but there’s always an opportunity to make more games! Their Adam Wolfe release was also a move in that direction, making HOPA more accessible to a mainstream audience. And a game that perhaps combined HOPA with a more expanded tower defense game or a shooter, well, I can think of worse things, to be honest. 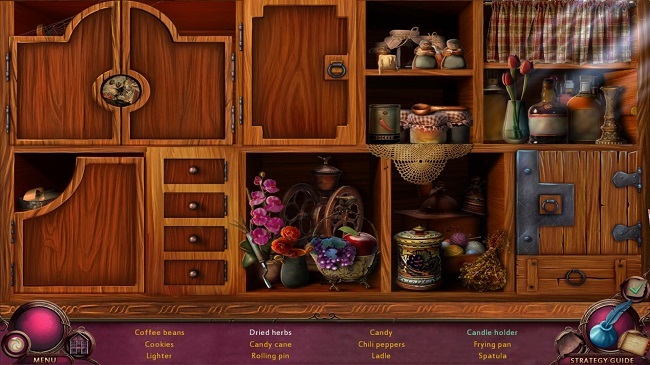 But a HOPA is still a HOPA and needs to have one important detail: hidden objects. 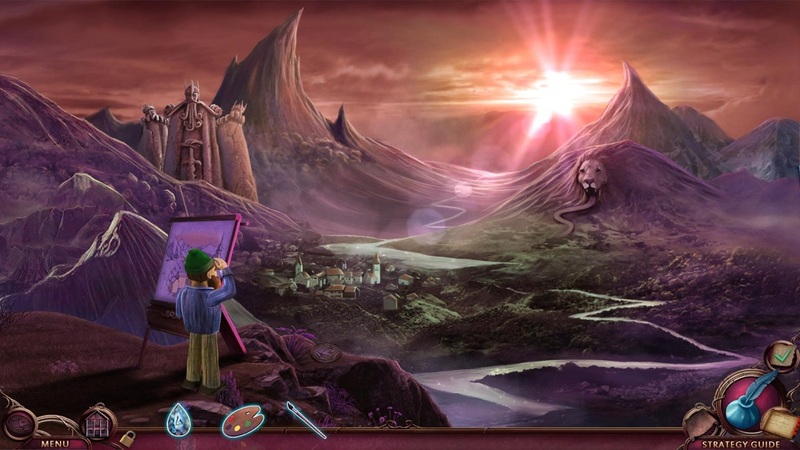 What I’ve always liked about Mad Head Games’ games is that they do take the hidden object aspect of their games quite seriously. To the point where they don’t just relegate it to a few sequences per game but it tends to be felt throughout the game. Sometimes the game throws simple little scenes at you that you don’t even realize are hidden object scenes until it’s too late! By the gods! 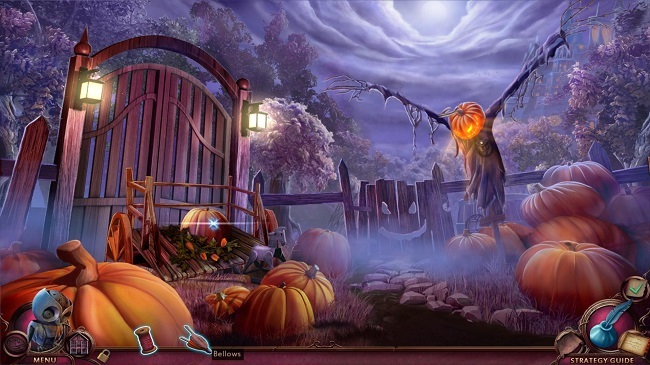 And they put a lot of love and effort into their hidden object scenes as well, no two alike… well, that’s not entirely true. But it comes close, there’s a lot of variety so it never becomes stale. Maybe I would’ve liked to have seen a few more inventive solutions but overall it was just fun. Lots of interactivity in some areas while also giving you some classic layouts. You never quite knew what you were gonna get which is always good. Again, that pesky thing called “lack of challenge” rears its ugly head, many hidden object scenes mere stepping stones getting to where you needed to go rather than obstacles. But I can’t hold that against Mad Head too much, once you’ve played enough HOPA it’s rare to find one that truly challenges you without being a cheat at the same time. There are two things I want to talk about before I let you go away to buy this game: music and the main menu. Put quite simply, the music is absolutely gorgeous. And if you thought “Eh, the graphics are good, I guess.” Well, you just wait until you see it in game with moving parts and a fantastic soundtrack accompanying it expertly. Hell, I’m listening to the soundtrack right now (included in Collector’s Edition) and it’s a tremendous listen even outside the game. Seventeen minutes of mostly soothing music that actually manages to tell a little ministory if listened to in order which is a damn fine feat. I highly recommend getting the Collector’s Edition for this alone but Mad Head Games is one of few studios that always makes the CE well worth the purchase. You get some more tower defense gameplay, collectibles that unlock additional stuff (concept art, wallpapers, previously mentioned soundtrack) for your perusal and a whopping two additional extra chapters. The game will tell you that’s it’s like four but, really, it’s an epilogue to the story then three smaller that revisits the worlds you traveled to in the main game. But I’d argue that the three smaller chapters are really just one big one. I’ll fight you over this! But seriously, I rarely recommend CE’s since bonus chapters tend to be the only draw and they rarely matter much but here I definitely suggest getting it. And finally I want to talk about the main menu. Short detour, I promise, but it’s stuff like this that shows how Mad Head goes juuuuuuuust a little further than most HOPA developers. The main menu changes depending on where you are in the game. Yeah, I’m not kidding. I didn’t notice it at first (I tend to play through HOPA in a single sitting) but I did notice in time and took a couple of screenshots just to show how it changes. I also thought it was a clever piece of foreshadowing to the plot of the game but perhaps I’m just reading too much into it, eh? Eh, Mad Head Games? Was that intentional? Hm? Tell me I was a good boy, Mad Head Games! So! Is it a good game? Despite my complaints about the story and the lack of challenge… yes, absolutely. I meant what I said in the beginning, it’s an awesome game. And to put how much that matters, I went into this game not wanting to like it. I know that sounds weird but I remembered so little about the first game that all I could remember was “fairy tale” and “romance” and… well, we have plenty of those types of HOPA already. No, I wanted to not like it so I had something to tear apart. But I liked it. A lot. So much so that I actually felt a bit of sadness as it ended. I want to continue exploring Taleworld for a long while yet. What’s that? More NeverTales games? You spoil me, Mad Head Games.